Ahoy captains and capettes! My newest and scurviest print is an undersea adventure with piratey treasures, and creatures of the sea. The crew of the Sea Otter is in search of sunken treasure. They find more than they were looking for when the curious creatures of the sea come to investigate the bright yellow intruder to their quite coral home. In contrast to my simpler construction machine illustrations; the undersea adventure illustration is filled with bright colour and detail. Treasures are hidden throughout the sea floor waiting to be discovered, and brightly coloured fish surround the adventurous little submarine. If undersea adventure and piratey treasures are what you seek then this submarine adventure may be just the thing for your cabin wall mateys. 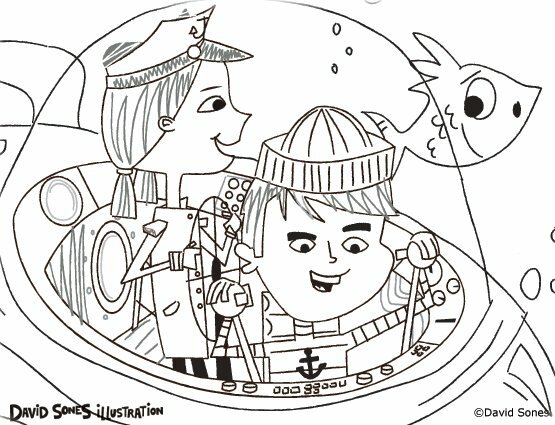 I don’t often post roughs of my work but when I do they involve submarines. Here’s a rough sketch for an upcoming print I am working on. Arrgh Matey’s!! Last week I launched the New Pickledog Blog – this week I am proud to announce the new Gallery Shop feature on my website! 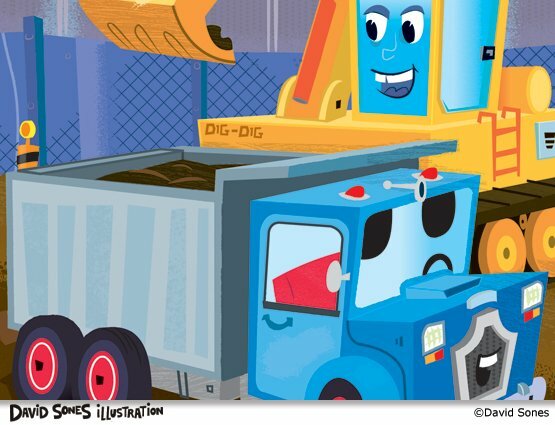 With the launch of my new shop, there are three colourful prints in my At The Construction Site series featuring Excavator & Dump Truck, Crane Truck , and a busy Bulldozer all at work on the site. The At The Construction Site prints were inspired by my son who is obessed with construction machines. Each print is digitally reproduced on 100% cotton acid & chlorine free paper. New prints will be added to my shop regularly, along with one-of-a-kind artwork coming soon. Welcome the new home of the Pickledog blog! Months of behind the scenes construction is finally complete. I am pleased to announce the Pickledog blog’s new doggy home here at DavidSones.com. Pickledog has moved here from his old home at GoPickledogGo, and we are starting over from Post One. It’s a big change, but it just made sense to combine my portfolio site and The Pickledog Blog together. The old blog will be archived, but unfortunately it wasn’t possible to transfer our older posts from GoPickledogGo to the new Pickledog blog. Not to worry though, because the new Pickledog blog is going to be better than ever – or a least I am going to start posting regular style again. So that’s good news eh? Pickledog and I are excited to get started here posting illustrations, and hopefully providing some creative inspiration as well. If you have visited my portfolio site before, you may have noticed a couple other new pages. Look for the grand opening of my Gallery Shop with prints, and artwork by me in the weeks to come.